Tuning out: How brains benefit from meditation ~ Health Matters Today! Meditation's ability to help people stay focused on the moment has been associated with increased happiness levels, said Judson A. Brewer, assistant professor of psychiatry and lead author of the study published the week of Nov. 21 in the Proceedings of the National Academy of Sciences. Understanding how meditation works will aid investigation into a host of diseases, he said. "Meditation has been shown to help in variety of health problems, such as helping people quit smoking, cope with cancer, and even prevent psoriasis," Brewer said. They found that experienced meditators had decreased activity in areas of the brain called the default mode network, which has been implicated in lapses of attention and disorders such as anxiety, attention deficit and hyperactivity disorder, and even the buildup of beta amyloid plaques in Alzheimer's disease. The decrease in activity in this network, consisting of the medial prefrontal and posterior cingulate cortex, was seen in experienced meditators regardless of the type of meditation they were doing. 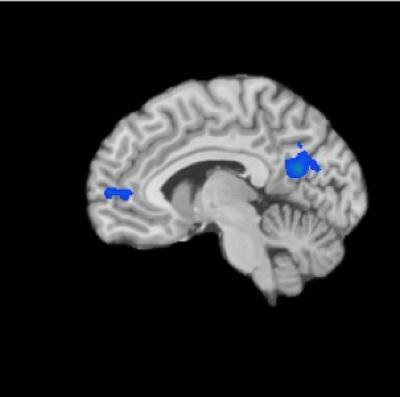 The scans also showed that when the default mode network was active, brain regions associated with self-monitoring and cognitive control were co-activated in experienced meditators but not novices. This may indicate that meditators are constantly monitoring and suppressing the emergence of "me" thoughts, or mind-wandering. In pathological forms, these states are associated with diseases such as autism and schizophrenia. The meditators did this both during meditation, and also when just resting — not being told to do anything in particular. This may indicate that meditators have developed a "new" default mode in which there is more present-centered awareness, and less "self"-centered, say the researchers. "Meditation's ability to help people stay in the moment has been part of philosophical and contemplative practices for thousands of years," Brewer said. "Conversely, the hallmarks of many forms of mental illness is a preoccupation with one's own thoughts, a condition meditation seems to affect. This gives us some nice cues as to the neural mechanisms of how it might be working clinically." Why has synesthesia survived evolution? Childhood obesity - what are the health risks? Is drinking water from plastic pipes harmful? Was Darwin wrong about emotions?